I'm feeling quite unwell but I don't know why. I'm fine if I don't eat but after I eat I feel queasy and my stomach feels unsettled. Last night I also dreamed that I was physically sick, which is unusual for me. I have crazy dreams but I've never been sick like that in a dream. Maybe my body is just worn down from the packing and everything, I don't know. It doesn't matter, I guess... what matters is that I'm cranky and tired and feeling icky. I'm going to take it easy tonight and try not to work too hard tomorrow. For the first time, we've decided to hire movers to move our stuff to the house. I've always moved my own stuff (with the help of friends and family) but I just can't physically do the work now. We do have friends that would be willing to help us but it would be exhausting for everyone. So in the interests of just getting 'er done, we're going to do this with movers. Because we're going to be using the movers we need to be sure that the destination room for each box is clearly identified. We'd been labeling boxes with the contents but not necessarily the room where the boxes needed to go, partly because we hadn't made those decisions. Over the weekend we bought five colours of duct tape (silver, white, red, black, and camouflage) and masking tape which we'll use to identify the different rooms. We figure that if the tape is seen on two neighbouring box sides - or perpendicular to one edge - it'll be easy to see from most orientations. The other advantage to this scheme is that we only need to put one big piece of tape on each box. When I'm finished the sewing room - which is getting close to being done - I'll go and label all of the boxes we've packed. Closing is only two and a half weeks away - eep! As we get closer and closer to our closing date, we're feeling the pressure to get things done. For example, I still need to make all the calls to switch things over to the new address, and we need to finish packing, and we need to go out and find a dinette set. I'm trying to stay calm and focused but of course I'm a little stressed. And of course there are life events happening all the time, too. I'm supposed to have my Pamidronate the day before closing and to see my oncologist the Monday after. I think I can manage the oncology appointment but I don't want to do the Pamidronate that week as I think we'll be very busy. I'll call to change the appointment tomorrow and hopefully they can accommodate me. We're going to be the proud owners of our very own appliances and a sofa! Yes, after weeks of shopping trips and research, we have finally purchased a fridge, stove, and washer for the house, as well as the sofa we decided on yesterday. After much thinking, we decided to go with Sears for the appliances because they have a good warranty and the company has been around for so long and is so big that if we run into problems, they'll still be around. We started off at Sears Home, where we'd originally seen a lot of stuff, but when we were there there was practically nothing on the floor. I became very disappointed and overwhelmed by this because we didn't want to just put in an order without looking at the appliances again and checking them out. So we went to the Sears at the nearby mall and bought the appliances there. They had such a great selection! We ended up buying Kenmore appliances because the brand is fairly reliable and the warranty is good. We bought this bottom-freezer, french-door fridge (made by Amana, we think). The freezer has wire cage bins that promote air circulation and the fridge has all the adjustable shelves and extra storage areas that we wanted. We bought this slide-in dual-fuel white Kenmore range. We decided on a slide-in model so that the oven controls were at the front of the stove instead of the back so that I don't have to try to reach over pots on the stove to get at the oven. Also, we get the gas cooktop, which we wanted, and the electric oven, which we're used to. All we have to do is hook up the gas (we elected to have Sears do it) and we don't have to touch the electric. The only extra warranty we bought was for this range because we've read that the electronic control pad is especially vulnerable to heat and breaking on this type of model. Choosing the washer turned out to be a bit more complicated. Our plan had been to buy an LG washer but after talking with the sales guy we decided on a Kenmore (made by Samsung) front-loading washer because of the way it balanced the load. The LG balances an unbalanced load electronically while the Samsung/Kenmore uses ball bearings to mechanically balance the load. The sales guy actually demonstrated the washer spinning a single towel (definitely an unbalanced load) and we were impressed with how it balanced the little load. We also upgraded the washer to have a drum with smaller holes so that clothes wouldn't get forced into them when spinning. The drum has a dimpled design and somehow it works. This washer also has a sanitize cycle and a quick cycle, just like the one we'd been considering before. We'd been hoping to get a white washer but the only choices were dark blue and flame red... so we picked the dark blue. It won't go with our white dryer but that's ok with us. We ended up purchasing this washer. Lucky for us, Sears was having a sale on these appliances and we also had a coupon to save on appliances from our home inspection company so we ended up saving quite a bit on these purchases. Plus we got a Sears card with a big points club multiplier which will give us cash back or a Sears gift card or something so we saved even more. We'd thought that it would take no time at all to order these appliances but in the end we spent about two hours looking at and actually going through the purchase process. We wanted to be done then but sadly, we still needed to buy the couch we picked out. Since we went to all that trouble yesterday to choose it we figured we should order it because it'll take five or six weeks to arrive. We thought the ordering process should take no time at all because we'd already made our decisions but it ended up taking another hour. 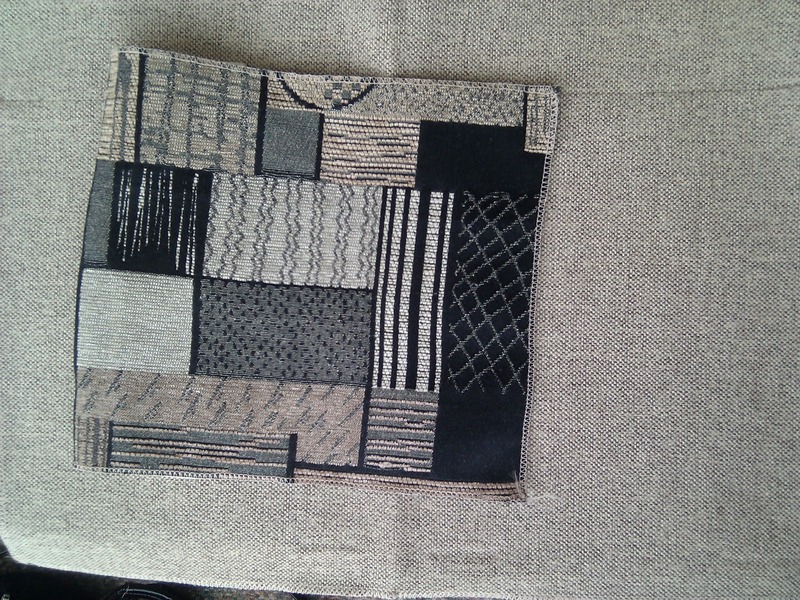 The colours aren't quite perfect in the picture, but the main fabric is a light grey-taupe. One thing I love about the accent fabric is that each of those rectangles is a different texture. While we were waiting for the purchase to go through I played with the accent fabric, running my fingers over it and tracing out all the lines. It turns out that the store will allow us to borrow their fabric samples anytime if we need them. We can also order the fabric itself if we wanted to make curtains or upholster or cover another piece of furniture. I could see that accent fabric on a chair of some kind, maybe. After spending all this money we thought we were finished shopping Until we remembered that we still need to buy a dinette set. We know what we want and just have to find it so we'll look for it this week. Once that's done we won't be buying anything more until we're in the house.... although we do have our eye on Palliser Rhumba theater seating (with power recline). It's the most comfortable theater seating ever and the power recline is fantastic, but we can't buy it until we know what space we're using and how we're going to set it up. Finally, the fabric is packed. Well, except that I have two small bins that I need to combine into one big bin and that then need to be filled with the fabric allocated for them. It's either that or I buy more small bins but I don't know if it's worth it. So my fabric fits into about 25 of those 10Gal bins. Each of those bins is 24" x 16" x 8.5" or so, and I was trying folding my fabric so that it fit into a 12" x 8.5" area, fitting two fabrics into each row. I couldn't do that all the time, so I think if I say that I fit 1.5 fabrics per row that would be fine. With that information I can figure out how much space the fabrics will take up on shelves but I'm too tired to do the calculations. One thing I have to decide whether I want to fold the fabric flat or upright, and space considerations may make that decision for me. I think that storing my fabrics upright, wrapped around acid-free comic book backer boards or something similar, will take up less space than storing the fabrics flat. Plus the fabrics are easier to find when they're upright - it's the way the fabric stores do it, after all. Some of the most delicate fabrics will be better off hanging and others should be stored on rolls. I'm making progress in the sewing room. It's taking longer than I thought it should have because I had to re-fold any fabric in the pile on the floor. I also had to press lots of those fabrics, too. I've finished packing the ginormous pile on the floor along with a couple of other fabrics. I've filled (well, over-filled in some cases) eight 37.9L (10Gal) Rubbermaid Roughneck bins with fabric. Half of those contain my knit fabrics and three of the other four contain my specialty fabrics. We went out and bought another six of those bins which I think will be enough for the rest of my fabrics. We can also get more if we need them. Once I finish packing up the fabric I've got to pack up the mess on the tables. There's a lot of stuff on those tables and packing it up will be much like doing an archaeological dig. There's unfinished projects, pattern pieces, full patterns, traced patterns, pins, needles, thread, trim, buttons, magazines, and more... and all of it needs to be sorted and put away. I can't wait for it to be finished. Tomorrow I'm starting the book club again and Thursday we've got appointments in Mississauga all day, so I won't get as much packing done this week as I'd hoped. As long as I finish packing by the end of next week I'll be happy. Just like with the books, sorting while packing makes putting things away in the new house easier.I'm so excited about my sewing room, even though I know that it'll take time to finish. We need to go to the house and get some measuring done for the appliances, so we picked up some paint chips to try and figure out what colour the walls are. I also picked up a bunch of very light paint chips to look over for my new sewing room. I'm so excited to be looking at these paint chips and imagining what the space will look like. Of course I also just love looking at paint chips and imagining the possibilities with them. Speaking of new tv shows, I happened to catch that new History Channel program William Shatner's Weird or What? It seems that hey take strange events and try to figure out how those events could have occurred. One of the segments I saw was on UFOs, where a whole town in Texas saw lights in the sky. Was it flares? Or fighter jets? A UFO? A top-secret US military flight program? Personally, I think the US probably does have a super-secret military program where they're developing crazy flight technology. I wouldn't put it past them - to me, it's the kind of thing the US government would do. I also think that it's likely that the planet has been visited by aliens. At least I hope they've been here. To me there's no question that life exists somewhere else in the universe because there are other planets out there and I'm quite certain that life of some sort exists on at least some of those planets. From there it isn't a big stretch to me that some of that life might visit here. Some people wonder why aliens would visit this planet and not contact world leaders - although why they think that world leaders would necessarily tell people that they'd been contacted by aliens, I don't know. There are cave paintings from multiple, isolated cultures (yeah, I know the website may not be the most credible but it does bring all the images together in one place) and other very old artwork out there of strange looking creatures and UFOs. I wonder if perhaps human evolution was "nudged" a bit, and if so, the ones who did the nudging might want to sit back and watch the way humans have evolved. Then again, SETI hasn't heard anything from anyone else in the universe, which doesn't make sense if there is anyone else out there. Unless they're staying quiet for a reason. I wish I could see a UFO because that would be so cool and awesome. Until that happens, I've got the tv. And packing. I am the laziest person ever. I'm supposed to be packing and I haven't been doing that. If only everything would pack itself... but it isn't. So I sit here, watching the stuff stay as it is, while I do no packing. Mostly I've been sleeping. For whatever reason, I've been really tired and am sleeping long past the usual time I get up. I hope that I'm back to normal over the next couple of days because I'm starting to feel the pressure of not doing any packing. This pressure seems to be leaving me sort of overwhelmed and paralyzed so that the more packing I have to do, the less I'm doing. It happens with my sewing, too, which is why I've done no sewing lately. I'm sort of wondering where summer went. I remember having some really warm days but it's been cool and rainy out there this week. The other great harbringer of fall is Fall tv. America's Next Top Model cycle 15(!!) started today and I know that other shows, both returning and new, are on their way. Thinking about ANTM, Tyra is still comparatively young as a host but the difference between her age and the ages of the aspiring models was very pronounced in tonight's episode. The stick-figured models-to-be are all squealing and shouting while she's calm and centered in her curviness. She's been out of the regular modeling business for a while now. Soon there will be contestants who were born after she stopped modeling and who have no idea who she really was or why she's there. I've noticed that the ads and promos for upcoming shows are starting to take over much of the screen which is annoying. NBC is especially bad in their promos because the promos cover up little things like subtitles and person identification titles. I'd complain to them, but it seems that Canada is not a market they're trying to cultivate or maintain. If it were, then shows that are only shown on NBC and not on a Canadian affiliate (like the late and awful Persons Unknown) would have been viewable on the NBC website. I wish the tv stations would make it easier for their viewers to watch their programming. Language is a funny thing. I think of it as fixed but it's fluid, with new words and meanings being added to our vocabulary all the time. Even popular phrases come and go. People give "150%" to find something with the "wow factor". One word that was made up only a few years ago that I strongly dislike is "previvor". According to the people who made it up, "cancer previvor" means "survivor of a predisposition to cancer" although nowadays the "cancer" is assumed and they're called just "previvors". Apparently people who've been diagnosed with the genes linked to ovarian and breast cancer want a label other than "unaffected carrier", which apparently is what the medical community uses. I have a strongly negative visceral reaction to the word "previvor". I get that people want a label, but this one implies that they're going to develop a disease - which is by no means certain - and that they're the only ones who are genetically predisposed to develop it - which they can't know, because researchers have only found two genes so far that are connected to breast and ovarian cancer. Apparently I'm not the only person who's had cancer (or "survived it") who reacts the same way I do to this phrase. An organization called FORCE (the ones who made up the word) is trying to get legislation passed (H Res#1522) so that the US recognizes a Hereditary Breast and Ovarian Cancer Week as the last week of September, with the Wednesday of that week to be designated "Previvor Day". Apparently this designation is critical in the fight against hereditary cancer. They talk as though this is a fight for all hereditary cancers, but it's only for the few genes for breast and ovarian cancer. Honestly, there are more diseases out there than hereditary breast and ovarian cancer and researches don't know all of the genes that define this hereditary cancer. And what about other hereditary cancers? Why should they be excluded? What makes these genes more important and deserving of notice than any other? I'm deeply offended by the idea of this proposed legislation - especially the idea of a "Previvor Day" and hope it won't pass. There is nothing critical about designating the week or a special day; honestly, the calendar doesn't need the extra clutter. If I was in the US I'd write my House Representative and speak out against this legislation and especially against a "Previvor day". While I was in Toronto I ended up buying books. I love books and I love reading; in fact, one thing I'm excited about in the new house is that the main tv will be downstairs and the living area will be on the main floor. So anyways, I was really excited to see the book 20th Century Ghosts, a compilation of short stories by Joe Hill. I've come across Joe Hill's stories in a few anthologies and really enjoyed them. Now that I've read this latest compilation, I have to say that Joe Hill is one of the best writers I've come across in a long time. The stories and situations stay with me long after I'm finished reading. I've even caught myself thinking about the stories and situations, asking myself things like, "How cool would it be if inflatable people existed?" or "What if you could create tunnels that led to other worlds?" Most things I read don't stay with me like that. Although many of his stories have a horror bent to them, not all do. Some of them are more fantasy-based, some are just snapshots of life. Some are sweet and reflective and others are deeply unsettling. This man is a very, very talented writer. I want to read everything he's written because the worlds he creates are so compelling. I want to know whether his novels are as good as each of his short stories. Interestingly, his father is Stephen King (the writer). Stephen King is good; Joe Hill is better. Much better. If you like fantasy-type or horror stories at all, give Joe Hill a try. You won't be disappointed.